With the release 2015’s Beasts of No Nation, the streaming giant Netflix began producing their own Netflix Original movies and to this day their library of original content starring high profile actors and actresses continues to grow. Now we see the release of Netflix’s biggest original movie to date, War Machine. Written and directed by David Michôd (Animal Kingdom), War Machine is a satirical war drama that acts as a fictionalised adaptation of the non-fiction book The Operators written by journalist Michael Hastings in 2012. The plot is as follows; When US General Glen McMahon (Brad Pitt) is placed at the helm of the war in Afghanistan this very charismatic and energetic leader is determined to use his self-proclaimed hero status to bring order to a war that according to him is being handled incorrectly. Now where it is his own hubris that is the cause of his eventful rise through the ranks it is this same quality that ultimately leads to his eventual downfall. Michôd presents much of this plot within the scope of reality but weaves in satirical story beats here and there providing a fresh comical take on the modern war drama. 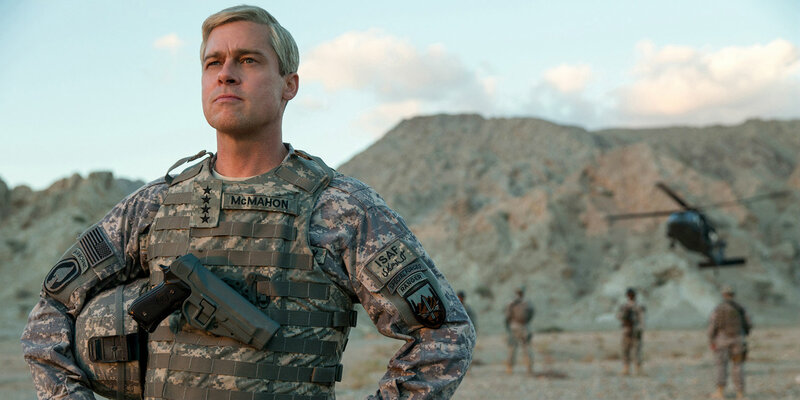 War Machine boasts an all star cast with names alongside Brad Pitt including Anthony Michael Hall, Emory Cohen, Topher Grace, RJ Cyler, Will Poulter, Lakeith Stanfield, Ben Kingsley, Scoot Mcnairy and Tilda Swinton, among others. This was a good satirical war drama that featured strong performances across the board, some good intriguing dialogue driving the plot forward, and Michôd’s largely successful implementation of a consistent balance of drama and satire. Brad Pitt was undoubtedly the standout role as he virtually disappeared into his character making every scene he featured in that much more entertaining. Tonally the film worked for the majority of the time but some shifts from more dramatic sequences to subtly humorous moments weren’t as smooth as they could have been. And in terms of pacing, it progresses at a consistently slow pace that at some points could have been tightened up to prevent unwanted dragging. I will begin with the performances at the forefront of the film as I feel without the big name cast bringing in their talents this would have been a sub-par experience. Much of the supporting cast put in strong performances that either added to the dramatic elements, the comedic moments, or a combination of both. Anthony Michael Hall, Will Poulter, and Topher Grace for instance played off Brad Pitt’s character really well and it was this clashing of personalities that gave their characters a strong presence and made their scenes specifically interesting to watch. RJ Cyler is a young actor who I have loved in his past projects (Me and Earl and the Dying Girl, Power Rangers) and although he has a limited role here I thought in terms of humour he was a big standout with great comedic timing but was also able to remain subdued for some key dramatic moments. But as I mentioned earlier, Brad Pitt was undoubtedly the biggest highlight, he plays a very charismatic character in General McMahon who has a very distinct accent, distinct body language, and strongly animated facial expressions. Not once did Pitt break character as he was fully committed to the role, pulling off every strong dramatic scene with ease and successfully contributing to the comedic moments showing off his versatility as an actor to transcend multiple genres. The plot itself is a quite contained one in the sense that the war acts as a backdrop and setting to the real focus which is placed specifically on General Glen McMahon and how he shaped his rise and fall at the helm of the war in Afghanistan. This character focus places a large emphasis on the dialogue being the driving force in shaping the progression of the story, which I liked, the fact that the movie doesn’t rely on tension filled build-ups was refreshing in the war genre. But that said, being almost entirely a dialogue driven war drama means that it does progress at a consistently slow pace, this works for expressing ample amounts of character development but does lead to one or two moments of downtime where it was beginning to drag a little. Thankfully these moments are very few and far between so it doesn’t hold the film back too much. The key quality of War Machine is the way Michôd uses drama and satire in a way where one doesn’t overpower the other which would result in either an overly silly or overly serious plot. This balance is a difficult one to achieve and I think he has done a good job at implementing that…….. for the first two acts at least. Within the first two acts the plot is largely very grounded with moments of satire injected at regular intervals, at the same time the characters contribute to both sides of the equation with a bit of an emphasis on the satire in their performances, balancing everything out nicely. When the more comedic moments are implemented, most of the time they worked and led to some good laughs but there were a handful of moments that didn’t hit quite as well. Whereas, in the third act Michôd goes for a bit more of a dramatic switch where there is still a hint of satire present but largely it does feel tonally different. There is the presence of a pretty decent action sequence in this third act and even though this is a war drama I think it would have been better off without it. I mean, I understand the significance of the scene in contributing to General McMahon’s story arc but I feel like if they had just included the aftermath of the scene it would have been just as effective and fit better within the context of the film as a whole. So in the end, War Machine is a good, enjoyable satirical war drama (in the vein of the satire found in The Big Short (2015)) with a good amount of highlights to pick out, the performances being the most successful element. Brad Pitt is fantastic in the lead role and his performance really does set the tone throughout. There aren’t any particular elements here that were handled especially badly, but there are a number of flaws present in the pacing, tone, and handling of the plot that hold this film back from being great. Next ‘JOHN WICK: CHAPTER 2’ (2017) MOVIE REVIEW – Bigger and Better in Every Damn Way!